My current view is a darkened house, lit only by Christmas lights on the tree, and draped over various banisters and cabinet tops in my main level. If only it was appropriate to have these twinkling multi-colored lights and deep green strands cascading everywhere, all year long, I surely would as it’s the most soothing light I know. Plus, when I take my glasses off and the colors bob untethered in the air with a blurred edge, it’s pure magic. Everyone loves to sit by the Christmas tree. Christmas is but days away. Five to be exact. This year has felt different in many ways; quieter, more peaceful and focused. Less madcap. Less of everything. There was a simple cookie exchange with a group of close friends, and instead of baking like crazy to make a dozen cookies for each participant, we decided to only bring 3 dozen total, which gleaned us a smaller amount, but without the crazy-making. Because power failed for one friend, the other- pregnant and a Toddler Mama, well, you can just imagine the challenges of baking in that season of your life, and everyone else just said ‘Can this be fun instead of hard?’. To which we all, resoundingly, agreed. So we gathered, sat by a crackling fire and laughed about the absurdities of life and when it was over and we walked to our cars, a gentle snow-globe snow was falling to big smiles all around. We are Minnesota girls to heart, and we all love snow. And by the way, most of those cookies are already gone. The snow, however, continues to fall. Snow globe like. More pure magic. There was the heater core that failed on Mike’s car, too, on the cusp of the coldest week in Minnesota in more than five years. There might be a hiccup in the car that can be set aside for a more flush time, if that ever exists, but heat is essential and he was tired of numb fingers and toes so we plunked a chunk in to that and wheeee…… there went Christmas. Sort of. I stamped my feet and pouted a bit over that, and a few tears stung my eyes at the rotten timing, but Christmas will come, like the Grinch discovered, without packages, baubles and bows and I know, really know the true meaning of the holiday. The presents are pretty, and festive. But when I look around at what is contained within these walls of my twinkling home, I see healthy folk, (and two happy kitties) with full bellies and hearts and a rapture that can’t be bought with a dollar sign of any amount. It’s far more clear this season, of cold days that seem to crack through a deep breath, of the hustle around you and the holiday smiles and the pre-Christmas full moon that created that breathtaking luster of midday in the middle of a frigid December night, that my wish list was fulfilled by His birth, that of which the angels sing. While I’ve known this for eternity, it seems, the truth of it has landed this year with something far more solid. I’m figuring out the next steps, here on this blog and on the path I walk daily, trying to determine A) what can a blog of nearly 8 years continue to offer, and B) am I truly living my life as God intended, with the gifts that He gave me, to the potential that I am capable? Big words. And an even bigger reach for my arms, and my heart. Are you with me? Let’s welcome 2014 together, then. Merry Christmas Kate! I love to read your blog and hope you will continue it. I always enjoy reading your blog, Kate. Even though I don’t comment often. 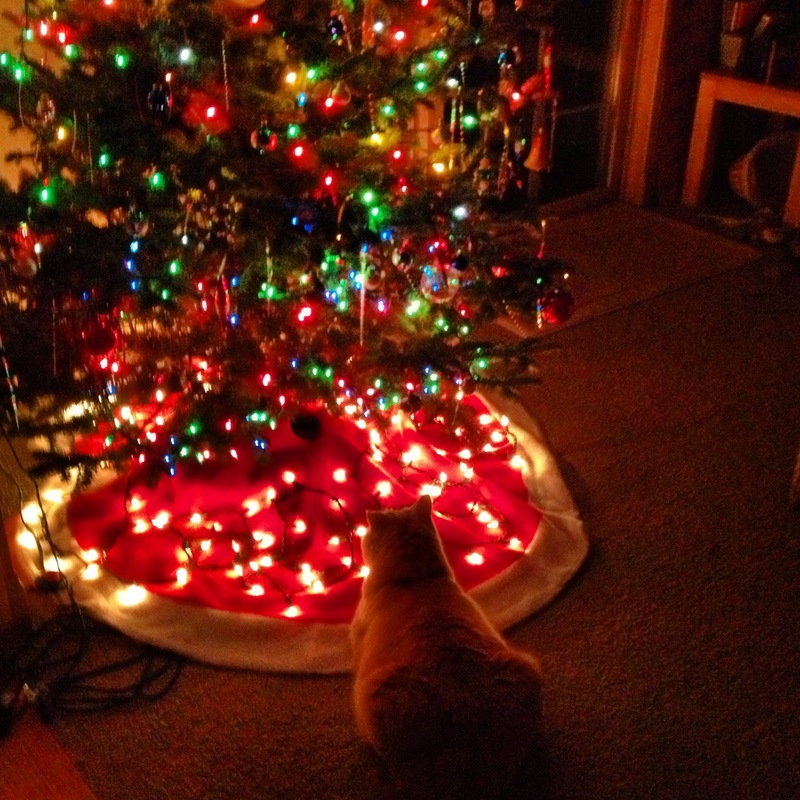 Loved the photo of one of your cats curled up by the tree skirt. 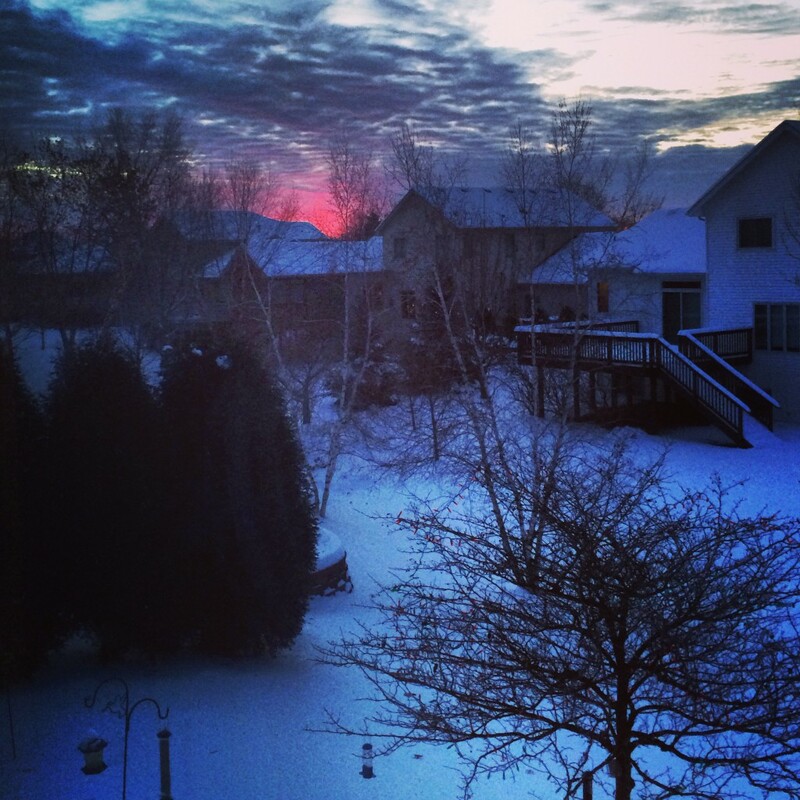 And the sunset – wow. Hard to believe you can get that lovely coral-pink color with inches or feet of snow on the ground. We had one of the most beautiful sunsets here in So. Calif. about 2 weeks ago (and it was extremely cold for us – down in the 40’s) and I couldn’t get any of my pictures to show the drama of it. Tried, but not enough zoom in the camera, I suppose. Thank you for your day to day insight on life, and how God takes a place in the middle of it. Our pastor, this morning, talked about joy – that we as humans, and God’s children, can’t really experience joy unless we’ve experienced sorrow, so we can recognize joy when it does happen. If your family is well, your house is warm and cozy, that’s what life’s all about. That’s joy. And you’re blessed. Despite the car repairs! Kate, thanks for providing this moment of peace and reflection. Wishing your family an early Merry Christmas!